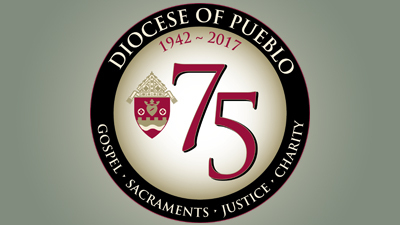 The announcement of the creation of the Diocese of Pueblo came from Pope Pius XII by decree in late 1941 followed by the announcement from the Holy Father of the appointment of Rev. Joseph Willging, a priest of the Diocese of Helena, Montana, as Pueblo’s first bishop. Bishop Joseph Willging was ordained on February 24, 1942. He was installed as Bishop of Pueblo on March 12, 1942 at the Cathedral of the Sacred Heart in Pueblo. It is this March 1942 date, when Bishop Willging was installed bishop, that will be used to mark the 75th anniversary. Prior to the creation of the Diocese of Pueblo, the land in southern and western Colorado was part of the Diocese of Denver. With the creation of the Diocese of Pueblo, Denver became an archdiocese. In March 1952, after 17 years as bishop, Bishop Willging died suddenly of a heart attack. Shortly thereafter, Bishop Charles Buswell was installed as Pueblo’s second bishop on October 6, 1959. Bishop Buswell served the Diocese of Pueblo for 20 years. At the age of 65, he was succeeded by the third bishop, Arthur Tafoya, from the Archdiocese of Santa Fe. Bishop Tafoya was installed on September 10, 1980 and was bishop of the diocese until 2009. Following Bishop Tafoaya, Bishop Fernando Isern, a priest of the Archdiocese of Miami was ordained and installed on December 10,2009. He led the diocese until his resignation in 2013. The fifth bishop of Pueblo, Bishop Stephen Berg, was ordained on February 27, 2014 and continues to lead the diocese as it moves forward in the 21st century.